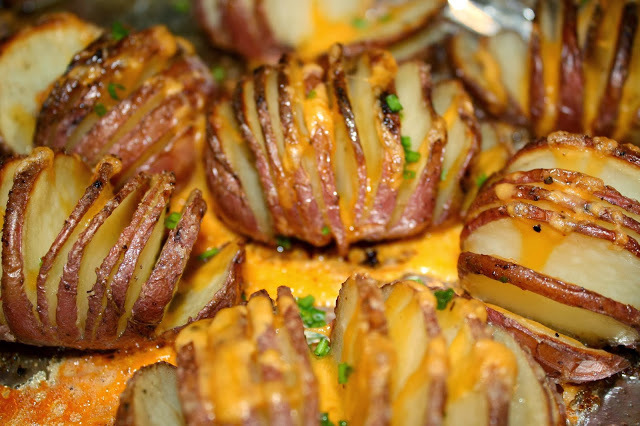 Appetizers : Benessere Oil & Vinegar, Inc.
Set each potato in to a large spoon and make thin slices along the length of the potato, using the spoon as a guide so as not to cut all the way through the potato. Pour the olive oil in to a large bowl or container. Toss the potatoes liberally in the olive oil, making sure to get it in between the slices. 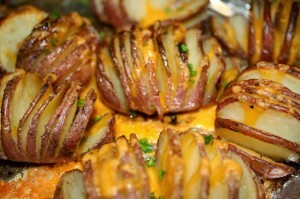 Arrange the potatoes on a foil lined baking sheet, cut side up. Sprinkle with salt and pepper to taste, making sure to season in between the slices. Bake for 30 minutes until the edges begin to turn golden brown. If desired, remove the potatoes, sprinkle with cheese, and bake for another 15-20 minutes until fully tender and golden brown. Adjust seasoning to taste, sprinkle with fresh chives for garnish, and serve with sour cream. You can serve these as an appetizer (have napkins close by) or side dish, or tossed with pasta. You can easily multiply this recipe, but you won’t have to use much more olive oil to coat the tomatoes. 1. Preheat the oven to 300 degrees. Place the tomatoes in a baking dish large enough to fit them in a single layer. Add the salt and sugar, and toss together. Add 3 tablespoons of Olive Oil, and toss again. Place in the oven for 45 minutes until the skins have shriveled and just split; the tomatoes should still be still intact. Remove from the heat, and allow to cool. 2. Arrange the tomatoes on a platter. Drizzle the remaining Olive Oil decoratively around and over them, and pour on any juices from the pan. Serve warm or at room temperature. Yield: Serves 8 to 10 as an hors d’oeuvre, about 6 as a side dish or sauce. Advance preparation: You can make these tomatoes several hours ahead of serving. They will keep overnight in the refrigerator. Place the ingredients inside the bowl of a food processor or blender and process until creamy and smooth in consistency. Adjust seasoning and store tightly covered in the refrigerator for up to three days. Great for use as a spread on some nice toasted bread. Equally delicious as a mayonnaise replacement, a dip for crudités or a spread fresh on grilled salmon.